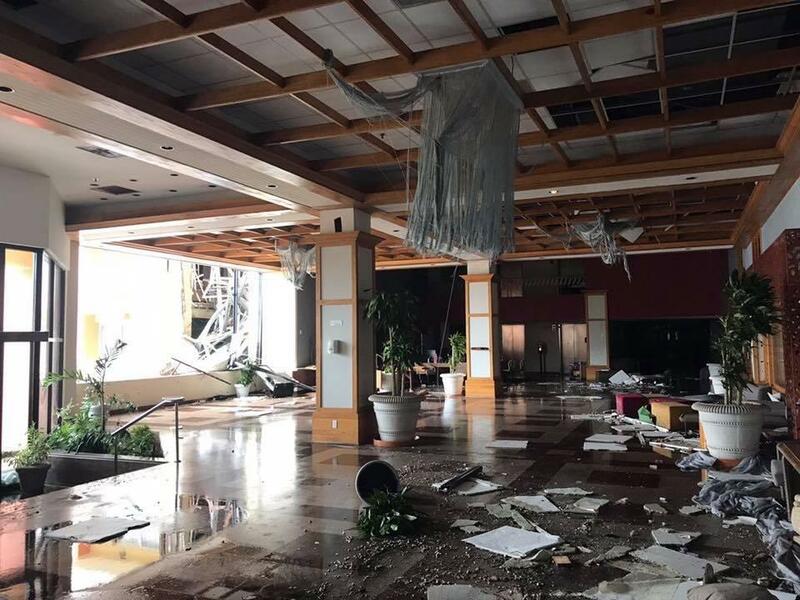 The lobby of the Sonesta Maho Beach Resort Casino & Spa in the aftermath of Hurricane Irma. The resort is where a wedding party from the Bangor area have been stranded since the storm. Members of a wedding party from Bangor amid waves created by Hirricane Irma before the Category 5 storm hit the Caribbean island on Tuesday. A Maine bride and groom and 13 members of their Maine wedding party remain stranded on the Caribbean island of St. Martin after Hurricane Irma caused widespread damage there. Much of the island is without electricity and running water. Buildings are in ruins, including the resort where the group was staying. Relatives here in Maine are working hard to get them home, even as another hurricane approaches. 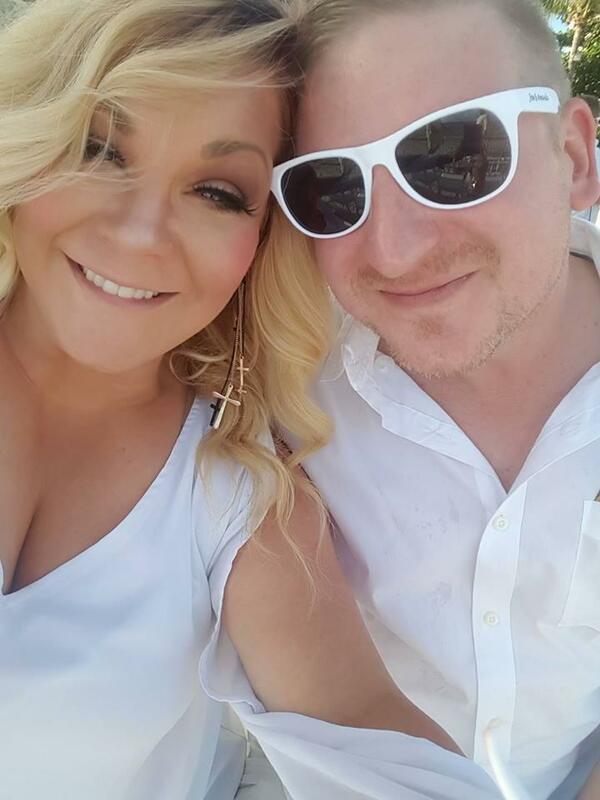 The wedding between Amanda Peterson and Joe Riley of Bangor took place Sunday evening on the beach outside the Sonesta Maho Resort in St. Martin. Forty of their close friends and family watched them exchange vows, including Amanda’s friend, Brittany LeVasseur. But what started out as a romantic vacation turned into something else just three days later. Since receiving that text a few days ago, it has been an emotional roller coaster for LeVasseur and the relatives of other members of the wedding party. Stan Peterson, the bride’s father and a teacher at Old Town High School, along with his 92-year-old mother and elderly inlaws, also attended the island wedding. While they were there, they learned there was a hurricane approaching, but Peterson says local residents told them not to worry, that St. Martin typically doesn’t feel the effects as much as other places. “We talked to hotel staff. We talked to the airport. We talked to the jewelry store before the wedding and everybody’s saying, ‘Yeah, yeah, yeah, it’s not big deal.’ They were all wrong,” he says. 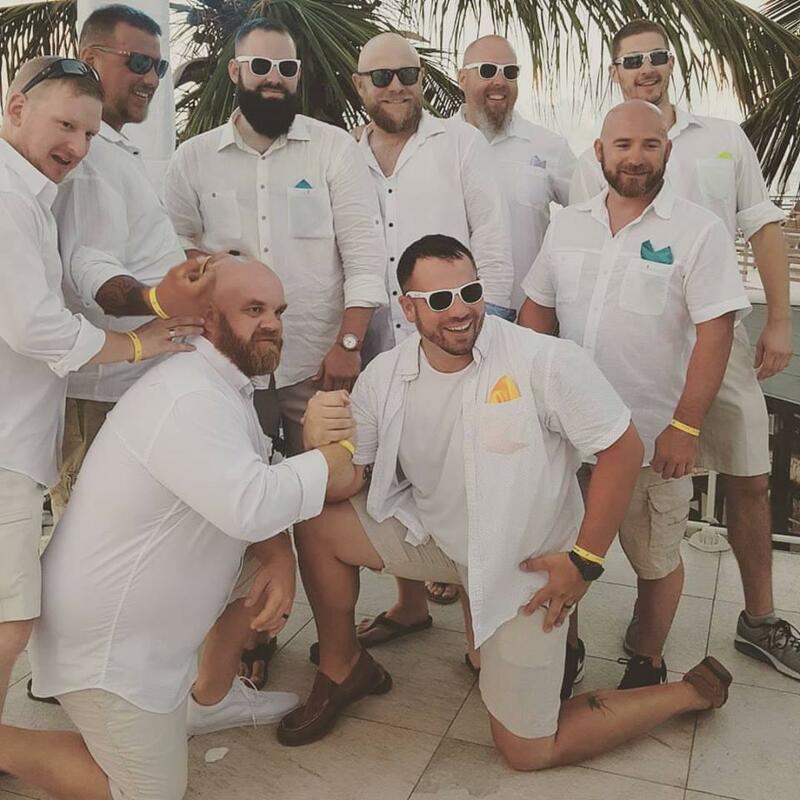 Groom Joel Riley (crouching, left) and men in the wedding party. Peterson and most of the group flew out Monday. But the bride, groom and 17 of their friends from the Bangor area stayed. By the time the hurricane passed over, part of their hotel had been demolished and they were left standing in ankle-deep water. Peterson says his daughter and his son, who is also stranded, have food and water and limited cellphone use. But conditions outside the hotel are bleak. “There’s a wedding party plus another group of U.S. citizens that are there and they’ve confined them to the room that they’re in because there’s so much looting and bad people around. They’re not safe going outdoors anymore,” he says. Peterson and other Maine relatives are now trying to figure out a way home for the group. They’ve contacted the offices of U.S. Sen. Susan Collins and U.S. Rep. Bruce Poliquin and waited anxiously for news about rescue efforts. Late Friday afternoon the family thought they’d gotten a break. Susanne LeVasseur got word that a plane was being dispatched to take some of the stranded storm victims to a different island before another hurricane, Jose, does more damage. “I had been notified that the Marines are there and that they are going to get 69 people on a plane and take them to an island to at least escape Jose, and where they’d have more provisions, and that they were going to start calling them by elderly, sick and in need and then women and children,” she says. LeVasseur says she has been assured that her daughter is on the list, along with three other women from the wedding party. Stan Peterson says his daughter, Amanda, was on that list, too. But Peterson says Amanda didn’t want to abandon her new husband, her brother or her other friends that she’d invited to join her on St. Martin, so she gave up her seat on the plane. “She’s got brains to figure out that it was her wedding, and she’s got some responsibility for what occurred there and is willing to assume that responsibility. How much prouder could you get?” he says. The plane had been expected to depart from St. Martin on Friday, but has been postponed. Meanwhile, Peterson and the other relatives are holding out hope that they’ll be reunited with the rest of the group sometime next week.